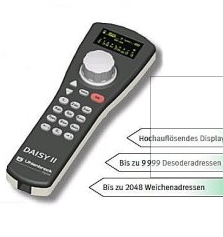 Uhlenbrock® has developed Daisy II, a handheld device for easy manual operation of model trains. Daiisy II is normally wired with LocoNet. 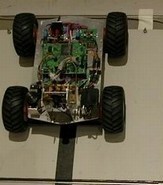 However the new version is using the GOT Radio Master and connects wireless to LocoNet devices as well as DCC centrals. Daisy II can be used of all Systems running DCC over radio whether that being model railroads, Car systems or large Garten railroads and is most used in clubs with many interactive users at the same time.